There are plenty of St. Patrick’s Day events planned in the coming days. Don’t test your luck with traffic or trying to find a place to park downtown — take Metro instead. Before you head downtown for the St. Patrick’s Day Parade Run this Saturday, March 14, park at one of our free Metro Park-Ride lots in Missouri or Illinois and take MetroLink to any of our five MetroLink stations serving downtown St. Louis. The race begins at 9 a.m. at the intersection of Broadway and Walnut Streets. The annual St. Patrick’s Day Parade will start on Market and 18th Street at noon and proceed east on Market to Broadway. The Union Station, Civic Center, Stadium and 8th and Pine MetroLink Stations are all within a few blocks of the Market Street parade route, and the Convention Center MetroLink Station is about six blocks north of Market. All are within a short walk to the parade. We will be monitoring MetroLink platforms on Saturday and will add service, if needed. MetroBus is another great option for getting to the downtown festivities on Saturday. You can ride on one of 13 MetroBus routes to the Civic Center Transit Center and walk a couple blocks north to the parade route on Market Street. Before you make your way downtown on MetroBus for the parade, be sure to check Rider Alerts for any reroute information. 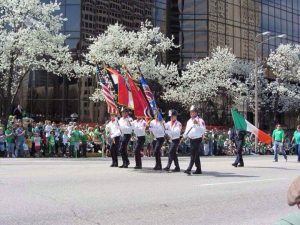 The Ancient Order of Hibernians St. Patrick’s Day Parade will be held Tuesday, March 17, at 12:30 p.m. in the Dogtown neighborhood of St. Louis. The parade will impact the #32 ML King – Chouteau, #59 Dogtown and #90 Hampton MetroBus routes, which will be rerouted due to street closures. The #90 Hampton bus will not provide service into Forest Park between the Forest Park-DeBaliviere MetroLink Station and Interstate 44 on Tuesday, March 17, between 11 a.m. and 5 p.m. Metro customers needing service into Forest Park during these times can catch a shuttle at the Forest Park-DeBaliviere station. Riders are required to pay regular Metro fares. Use Trip Planner to plan your trip to these and other St. Patrick’s Day festivities. For reroutes in downtown St. Louis Saturday and in the Dogtown neighborhood on Tuesday, make sure you check Rider Alerts. Have a happy and safe St. Patrick’s Day celebration!